A customer needed an attractive & professionally made Box to store personal mementos. After the basic design and sizes were approved, the construction particulars was left to the craftsman. A basic Box with the overall sizes of 9" tall x 12" square was constructed; the lid fits snugly on the Box. Cherry was used for the Box while an inlay of red mahogany was used as a contrast. 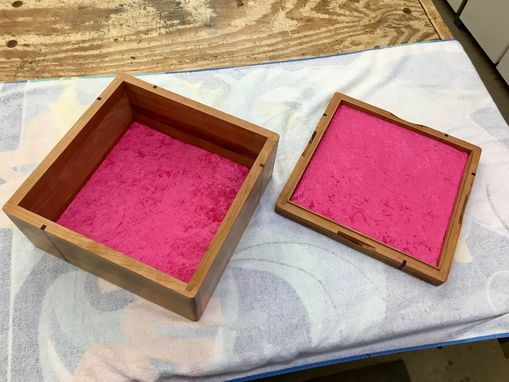 Soft, pink velvet was used to line the inside of the Box & the underneath side of the lid. Also, finger pulls were machined into the edges of the lid to allow ease of opening & access to the contents of the Box. 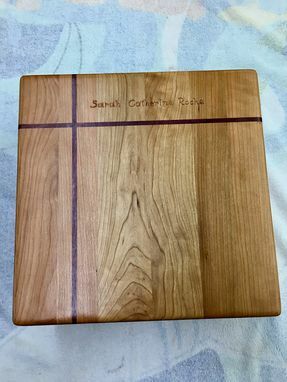 A final request by the customer was that they wanted a name carved on the lid of the Box. Finally, several coats of a satin polyurethane were applied to the outside of the Box, with a final coat of hand rubbed wax.